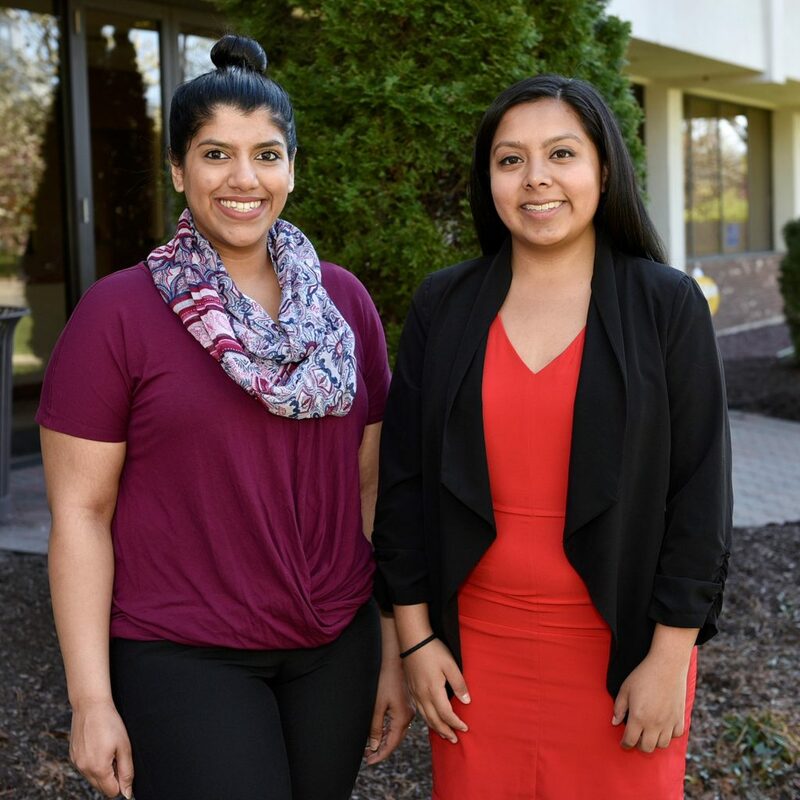 Western Connecticut State University seniors Evelin Garcia and Madiha Khan were chosen as winners of this year’s Henry Barnard Distinguished Student Award for their determination, demonstrated leadership, academic success and contributions to the community. Twelve Barnard Awards are given annually to distinguished students from Western, Central, Eastern and Southern Connecticut state universities. Khan and Garcia, who are accomplished in their own individual ways, also share several similarities. Both students are residents of Danbury. As children of immigrant parents, they have experienced the feeling of powerlessness, which they have transformed into opportunities to create change. Although they come from very different upbringings, they have both chosen paths that they hope will lead them to medical school. Garcia created her own major, a combination of Biology and Community Health Studies, and Khan is a Chemistry major with a focus on Biochemistry. Their hard work and dedication are demonstrated by their involvement with many different campus programs, including the Hancock Student Leadership Program, the WCSU Honors Program, the Collegiate Health Services Corps and WCSU’s Project Homeless Connect. Khan and Garcia have both made the Dean’s List every semester throughout their college careers and have been active in their communities. Garcia has wanted to promote health care availability in her community since childhood. For Garcia’s family, “health care costs outweighed the concerns of our aches and pains. Going to the doctor was not a norm, but a luxury we would never experience.” After experiencing the “constant denial of a basic human right,” Garcia became passionate about providing education and advocacy for local uninsured, immigrant and low-income families. She decided the best way she could bring about change was through a career in medicine. As she set to work toward achieving her goals in high school, she said that she met with resistance and was told that she “aimed too high” and that “college isn’t for people like you.” Undaunted, she applied and was accepted to WCSU. To pay her tuition, Garcia initially worked three jobs while taking classes and has continued to seek opportunities to grow. She took on leadership roles in various on-campus organizations and was accepted to the Yale School of Medicine’s Summer Medical and Dental Education Program, where she worked clinical rotations, took advanced science classes and served as a Spanish interpreter in the HAVEN Free Clinic. Garcia also has participated in other internship placements, including the University of Pennsylvania Perelman School of Medicine, where she conducted cancer clinical trial research, and the Seifert and Ford Community Health Center, where she was an Internal Medicine Observer. Recognizing that the changes she wants to propagate will require more than a medical degree, Garcia understands that she “needs to learn about the laws, societal issues and the development of progressive policies.” To do so, she plans to complete a public or health policy fellowship before attending medical school. Khan, who recently presented her senior research project at the American Chemical Society National Meeting in California, believed prior to attending WCSU that she was “powerless and couldn’t possibly make an impact on her community.” She is the youngest of four children and reminisced about the struggle her parents went through when it was time for her to attend college. “By the time it was my turn to head off to college, my parents were in extreme debt. I still remember my mom hunched over the couch, bawling her eyes out to my dad, unaware that I could hear anything,” she said. Khan began to feel empowered when she received the Presidential Merit Scholarship, which covers tuition and fees and is renewable each semester. “It was the first instance where I felt I had the power and ability to make a difference,” she said. “I was determined to be the best student I could be in order to make my parents, my community and my university proud. I have done so by making the Dean’s List throughout my entire college career.” She also received the Polyed Outstanding Achievement in Organic Chemistry Award from the Macricostas School of Arts and Sciences. Additionally, Khan has become a member of the WCSU Honors Program, served as a mentor and math teacher at the Danbury Masjid, and volunteered with numerous community programs including CT Mission of Mercy and WCSU’s Project Homeless Connect. She has served as Alpha Delta Pi sorority’s scholarship chair and the fundraising chair for the Chemistry Club, and is currently serving as treasurer for the Collegiate Health Service Corps. She also was selected as the featured speaker for the university’s 2017 commencement exercises later this month. Understanding the challenges new college students face, Khan has dedicated much of her time to mentoring students making the transition from high school to college through the Western Connection Program. She has been able to help students adjust to the social and academic changes they experience by providing support and guidance. Garcia and Khan received their awards at a banquet held April 4 in Southington.